(WOMENSENEWS)–I am the first to admit that the most frustrating part of this job is the not knowing, of the never knowing what happens after the boys leave. I hate the transiency, how quickly some of these boys cross over my emotions and heart as if I was a stone amidst a running stream. The flip side of the frustration is the not knowing–not knowing until they come back. Seeing a boy’s name on my morning list who I had just seen two months before. Of seeing that boy’s name three and four times in the course of a year. So, I’m damned if I do and damned if I don’t–do I want to know what happens next, or don’t I? It’s called recidivism–rooted in a Latin verb, caedere, meaning fall, and the prefix, re, go back, to fall back– which is not difficult to do once you’re back out on the street and limited in what you can do. As my worlds inside and outside of jail increasingly begin to intersect, I am reminded of this falling back in the oddest way. My husband’s home health aide Tyshana arrives early one morning and chats over a cup of coffee. She proudly displays photos of her grandchildren on her iPhone and explains her court motion to gain custody of her granddaughter from her son. My antennae heighten. At first, her reasons are vague. She dances around it, almost feeling the temperature of the room. Instead she talks about these kids in her neighborhood having kids as kids and her section of South Queens being divided into two gangs: the part inhabited by the Bloods, the other, the Crips. And I give her the opening to discover that her son has done time, a lot of it, and more than once. And that even with the birth of that adorable little girl whose photo I just saw on the iPhone, he’s gone back on the street and is using again. He had a chance for a job and a scholarship to a business college and, as she explains with frustration, he had a chance to turn things around. But he didn’t take it. And our lives intertwine. I talk about my frustrations with the system. With my job. I talk about my frustration with a system that elects to incarcerate juveniles of 15 or 16 or 17 for minor offenses rather than seeking better alternatives, even with evidence from the 2010 Juvenile Justice Report that this approach results in a 89 percent reoffender rate for boys and 81 percent for girls. I think of the boys I interview who recite a litany of Juvenile Detention Center names as if offering benediction. Tyshana lists the JDCs her son has resided in. He’s been in Rikers three times, and he’s just turned 21. Unlike 48 other states, New York treats 16- and 17-year-olds as adults despite the research that yells that doing so accomplishes nothing other than producing future criminals. Tyshana and I talk about our frustrations with a system that expects kids carrying felonies on their backs at age 17 or 18 or 20 to find a future. I think about Dyshone back in Long Beach and Diquan who hasn’t surfaced yet from Ad Seg (administrative segregation). And we talk about probation, how easily these boys blow it. Within three years, more than 25 percent are back in jail again. I talk with her about a system that already knows that carrying a felony pretty much bars you from doing anything worthwhile. It pretty much puts you back behind bars, a different kind, and now without the taxpayers’ expense. For a while. Because without a decent job or a decent education, you can pretty much expect nothing. And when you can pretty much expect nothing, then you can pretty much expect the kid to go back to doing nothing, to being nothing and to expecting nothing good. And you can bet nothing good ever comes of it. My husband’s home health aide knows all about this. Firsthand. Marybeth Zeman is an experienced educator who was also awarded a Laura Bush 21st Century Librarian Scholarship in 2007. She is presently the transitional counselor at the Nassau County Correctional Center where she sees boys, ages 16-21, caught in the criminal justice system. 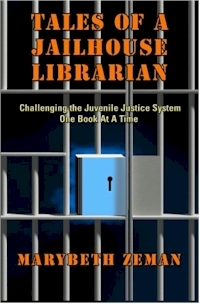 She never dreamed that she might put her librarian skills to use in jail. An Indian boarding school initiative for female teens has been hindered by electricity blackouts. Now the government is promising new, improved facilities and IKEA is offering solar lamps to light the way in the meantime.